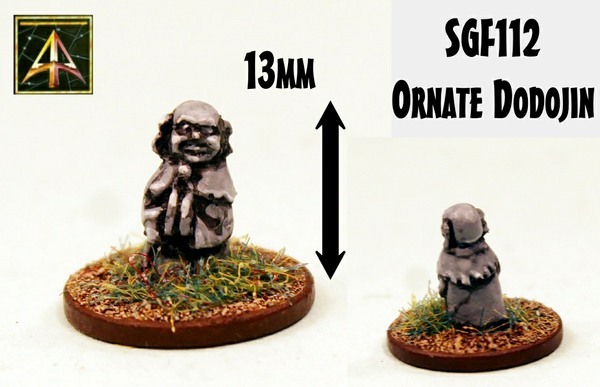 Alternative Armies bieten eine Reihe von japanischen Schreinen und anderen Geländeteilen in 15mm an. 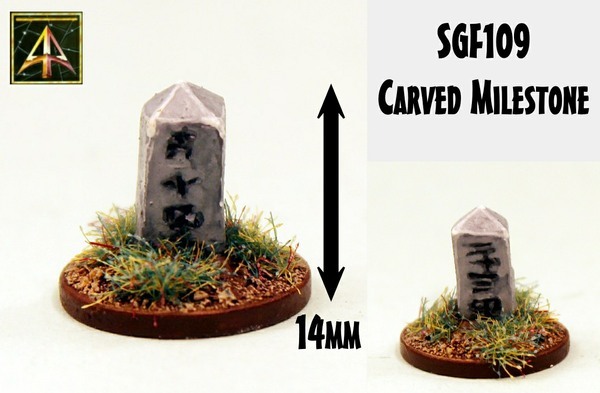 It is with great delight that Alternative Armies make a new pack and singles release for the Sengoku 15mm Japanese Fantasy Range. 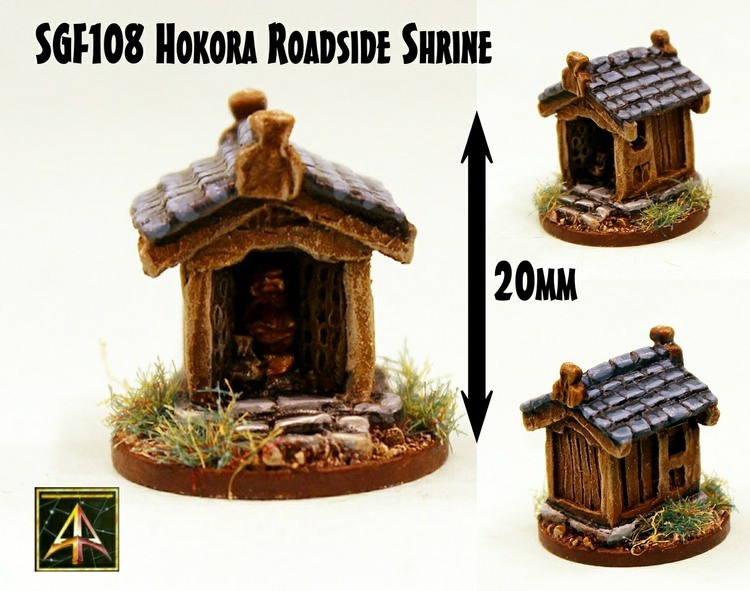 Shrines and Marker Stones to give your gaming table some extra scenic detail and to give interest to dioramas and to the bases of your humans and creatures. 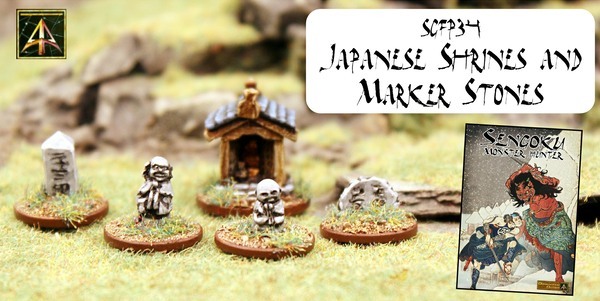 There are a great many new miniatures coming from designer John Bell and each month we will be added more to the Sengoku range. All of these releases will go well with and expand upon the Sengoku Monster Hunter game. Go HERE for the range or read on for more information. This pack contains twelve scenic one piece miniatures in a mix of five types taken from codes SGF108 to SGF112. Typical mix is as follows. Two Hokora Roadside Shrines, two Carved Milestones, two Humped Milestones, four Small Dosojin and three Oranate Dosojin. This pack offers a small saving off single purchase of these codes. Go HERE. You can also purchase all one hundred or so codes in the range as single miniatures including these new five. A small shrine dedicated to the spirits and to protect passing travellers for the wilds of the roads. 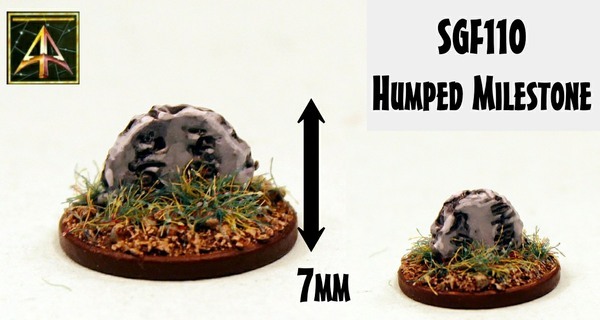 This one piece resin miniature stands 20mm tall and the same across at the widest point. An excellent addition to your collection and for your table. Supplied unpainted and without a base. Go HERE. Price 2.00GBP. By the side of the major roads of mythical Japan there are milestones telling the distance to the nearest places of note. This one piece resin miniature stands 14mm tall. Use it to guide the way across the table. Supplied unpainted and without a base. Go HERE. Price 1.00GBP. By the side of the side roads of mythical Japan there are milestones telling the distance to the nearest places of note. This one piece white metal miniature stands 7mm tall. Use it to guide the way across the table. Supplied unpainted and without a base. Go HERE. Price 1.00GBP. A statue placed in a safe but prominent place to ward off evil spirits and demonic forces intent on harming the local people. 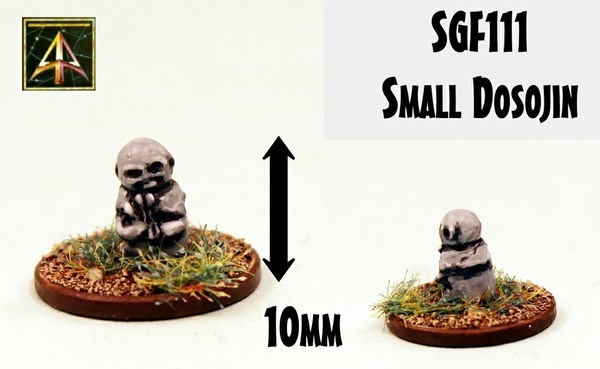 This small stature is a one piece white metal miniature standing 10mm tall. Great for your table. Supplied unpainted and without a base. Go HERE. Price 0.40GBP. A decorated statue chest high to a man placed in temples and villages to push away demons and creatures of evil. This statue is a one piece white metal standing 13mm tall. Great for your table. Supplied unpainted and without a base. Go HERE. Price 0.75GBP.